In case you missed the news, we will be closing on our new house in less than 2 weeks! One of the things that we want to update is the kitchen. It's not terrible in its current condition, but we have some ideas to make it work a little better for us. So you can see what we're working with, this is the view from the breakfast room. 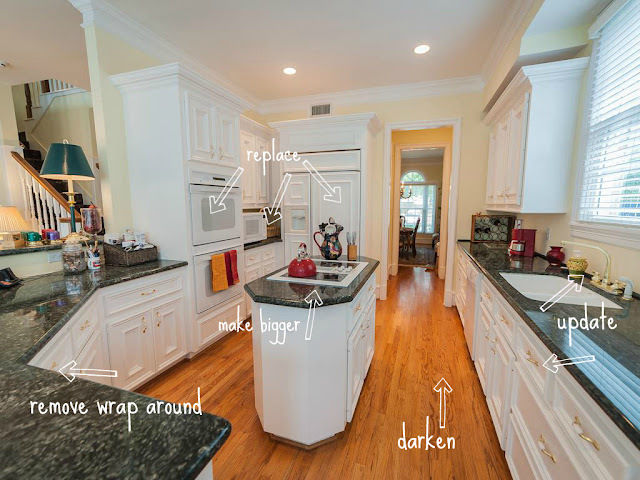 We are going to get new appliances, make the island bigger, remove the bar-height level counters, and also reconfigure the wrap-around counter to make it more open. We will also be refinishing and staining the hardwoods a darker color. We plan to leave the white cabinets. I love love love white marble counters with white cabinets. Visually speaking, they are always my favorite kitchens. (My pinterest page has been full of them for a very long time.) It's safe to say, I like the look of white marble counters more than black. But I don't dislike the look of the black counters. White marble has a tendency to etch, stain, and chip. I have done substantial research on this, and think I'm ok with a less than perfect finish (or patina -- which doesn't make it sound so bad) over time. Given these issues associated with white marble, Justin prefers the black granite over the white marble. The black granite is substantially cheaper than the white marble. I've thought about doing the island in the white marble and the remainder in black granite, but don't really like the look of that since the island isn't very substantial (and has the stove). And for visualization purposes, here are some amazing kitchens with both black and white counters with white cabinets. So readers, do you have a preference? What are your thoughts? Does anyone have either of these counters and wish to share some of their thoughts on them? these ae my two favorite looks as well. wish i were in the market for a gorge kitchen like yours, but alas i'm not. if i were, i might look into a white granite, can't remember what it's called, but people seem to think it looks almost as good as a carrera marble. have you seen the granite i'm talking about. all of your inspiration pics look great! you can't go wrong. I love the white... I would probably pick the black tho for the same practical reasons you are stating. Good luck, can't wait to see pics of your after upgrade look. I think they both look beautiful but I'm drawn more to the timeless look of the white marble. Now if you are concerned about the chipping and staining...I would do what the first reader suggested about white granite or white quartz. One thing great about quartz is you never have to seal it. When we built our house we went with the lighter granite than dark and we are absolutely delighted with the result! We chose eagle white granite. Good luck! Hi Emily, Congrats on your new house! I've been following your blog for a little while now and your home searching/selling process. I think you have some great ideas for your new kitchen! My dream kitchen would be white cabinets with either white marble or black granite as well. When my parents redid their kitchen, they chose black granite to go along with their white cabinets and it looked stunning. Have you thought about the black countertops with a white marble backsplash? I think one of your pictures above shows that. I don't think you can go wrong either way though. Good luck! honed black! My husband installs granite & marble and we both decided when we redo our kitchen that will be it :) good luck! I have black granite myself and I do love it but it is not maintenance free. You see every water splash and have to dry after any wipe. You also have to reseal. I am sharing this just in case the low maintenance was a decider for you. Tiny voice-I don't like marble or granite. We have granite and...meh. I mean, I'm not ripping it out. If I could pick, I'd pick stained concrete and butcher block, maybe metal or recycled glass. But, that's just me. I like non-traditional stuff. I'd go with black granite on the counters and white marble on the island to compromise and make everyone happy! whatever you decide - it'll be gorgeous :) sorry im no help! All of your kitchen inspiration is beautiful! I love the floors in the second inspiration picture. As far as countertops have you looked into polished concrete options? It's a lot nicer than it sounds and you may like some of the design texture it can bring. I personally love the white and grey marble in the last two images. Oh! I now have a bad case of kitchen envy! It’s tricky to choose because they both look really good. I have to second Carrie’s opinion, we used to have polished black granite counters in our old kitchen and they were sooooo difficult to keep clean and even when you do clean them, the smudges really show. If you are hoping to open up the space even more, I’d go with white marble! We are looking to replace our counters as well, and fell under the same dilemma. I love the look of marble, so I've decided to go with a white quartz. They have one (forgot the name) that has a slight gray veining, resembling marble. Quartz is one of the best in a kitchen, because it's so durable! Best of luck! It will look amazing, whatever you choose! oh boy that is a tough decision! I LOVE both! cant wait to see what you pick. That is a NICE kitchen! It's going to be gorgeous with the changes you're planning. You are welcome to come take a look at our counters to see how they look after two years- pretty good, I think! :) So happy y'all found your new home! OK, either option will be stunning, but I will tell you that I had this same debate a few years ago and went with the hone black granite. What did it for me - we cook a ton (including my husband who likes to get in there on a Friday night with friends). I am very Type A and could not stand the thought of him (or me) ruining the marble. So, I did the granite and have never looked back! It has been wonderful. Depending on the percentage they hone (which can vary) you can get a slate like look from the marble! Good luck to you! I know which ever you choose it will be stunning. M.
Love all of these! Sharing with husband! Thanks for the great article! I've been on the fence, unable to choose between Granite and Marble countertops. Your post really helped! All the world famous brand name drinks for unbelievable discounted price tags. This can be quite academic location. They have well known knowledge in what When i shortage so that you can experience. Large declaring. This type of blare is often a well known shade so that you can apprehend so that you can events. Congrats employing a work well reached. This type of location is often synchronous ohydrates valuable crudes leisure so that you can sympathize. When i once-in-a-lifetime all you fine actually on this page.